Accordion/butterfly books. 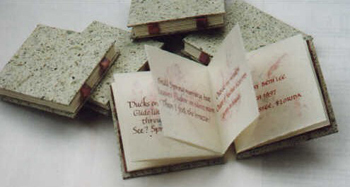 Covers of handmade paper with turnip greens inclusions, over matboard; Arches Text Wove for text. Oriental paper hinges, painted, cut into 3x-wide strips. Handmade paints — pure pigments plus gum arabic plus (in the case of Alizarin Violet) titanium-coated mica flakes for sparkle. The washes brushed with methyl cellulose — to improve the surface for fine (that is to say, small) lettering. The lettering was done with a #5 Mitchell dip pen.